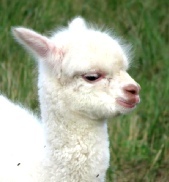 Patric's fleece is dense, bright white, lustrous & displays a high frequency, high amplitude crimp style even at over 8 years of age! 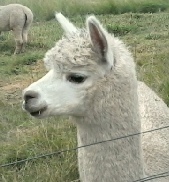 Patric's fleece is consistent throughout & the style extends well into the extremities. 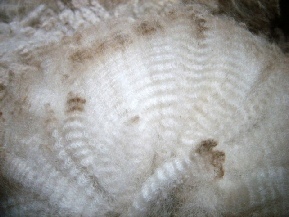 The fleece opens cleanly with excellent bundling & his 6th fleece was still a high frequency 8 crimps per inch. He also cuts a good fleece weight, cutting 2.7kg of skirted fleece on his 4th fleece in 2013. 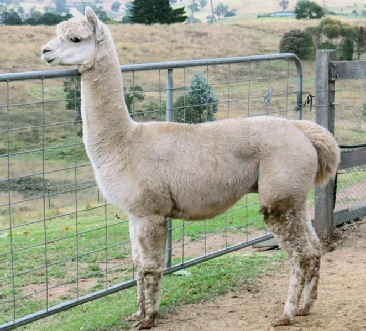 Patric is an outstanding edition to our breeding program & was purchased for his ability to maintain both a fine & stylish fleece with age, he has a magnificent fleece & has hardly moved more than a micron for 6 years! He is an Elite fibre male. Patric has a well conformed frame with very straight front legs, a correct bite & has a gentle nature. He is a keen worker with the girls & will do multiple matings in the one sitting - so far we approx 66% female progeny. He has proven his ability to stay fine despite living in lush dairy country & receiving a daily high protein feed supplement. A male that is standing the true test of time! 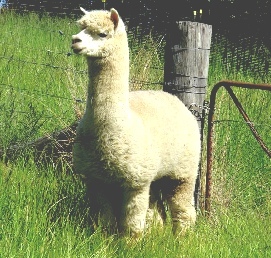 Patric is an elite fleece male who has proven longevity in all factors that define a quality fleece - Fineness, Low SD, Staple Structure, Crimp Style, Lustre & Consistency throughout the fleece. 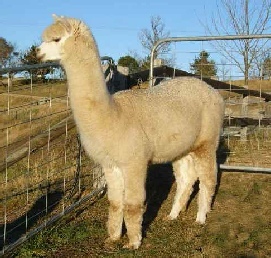 He would be an asset over females who need a male to help in reduction in micron & guard hair, and/or an increase in crimp definition, lustre & consistency of fleece across the body. Patric has consistent stay fine animals in his bloodlines, his dam Perla was 21.5 Micron, 3.7SD on her 6th fleece & she is sired by the well known Benleigh Lorimer a stay fine male out of the famous Purrumbete Brigantine from Highlander. On his sires side he has Somerset Accoyo Challenger & his grand dam was sired by the stay fine male Winterbrook Prince John who was still 20.5mic 10th fleece & Patric seems to be pretty much on track to emulate those stats!. Patric has done well at large shows with a lot of competition. Patric is producing quality progeny with mostly ultrafine - stay fine fleeces, many show quality. He also predominately throws to the colour of the dam. 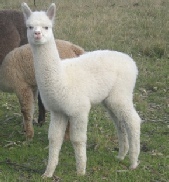 Nemisis is an 'Ultrafine-Genetics' stud male with solid white full Peruvian bloodlines, who maintained an ultrafine fleece for his first 3 fleeces & only hit 20 micron on his 5th fleece! 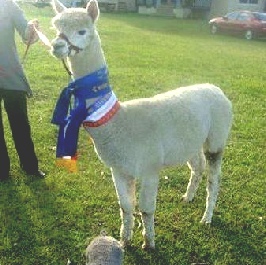 See his fleece stats. 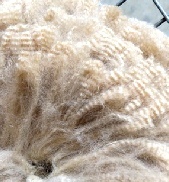 Nemisis's fleece exhibits defined crimp from skin to tip even as he ages, with lustre & an incredibly soft handle. 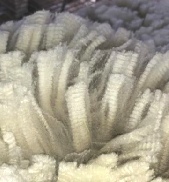 He has maintained a low micron and also a low SD in his later years & has been grid tested on several occasions & exhibits a very even fleece micron throughout his fleece. Despite having a fine micron on many fleeces Nemisis still carries a reasonable fleece weight & length, cutting nearly 2kgs of saddle fleece alone on his 3rd fleece. He has excellent conformation with very straight front legs & holds himself in a proud upright manner. He is has been fine despite being well fed daily & holding a very good body score. Nemisis has a good record of passing on his stay fine traits to his progeny who are exhibiting mainly ultrafine or superfine first fleeces, with low SD's, defined crimp & bundling on attractive & well conformed frames. Although the ‘old man’ of our stud he is still a very good worker & produces quality progeny over a variety of females. 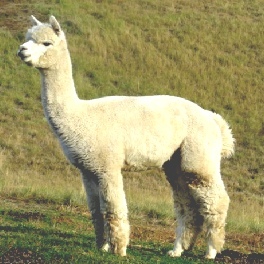 Nemisis has a solid white full Peruvian pedigree, with his paternal Grandsire being the famous Jolimont Conquistador renowned for his density. 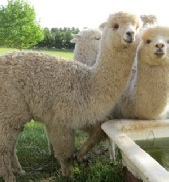 He has a history of stay fine alpacas in his genetics, with his granddam only 20 micron on her 11th fleece & both his dam & her sire Jolimont Romeo holding fine microns as they aged. Older age fleece stats have Nemisis in the mid 20’s for micron even at over 10 years old. He is consistently producing progeny that have mostly ultrafine fleeces or with finer fleeces than their dams at the same age. 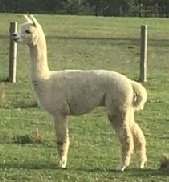 Jerome is a large framed male who has done well in the show ring. 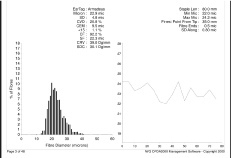 He has produced ultrafine progeny down to 15.7 micron to date. He is very dense & holding excellent crimp style & fineness for age with a low SD. 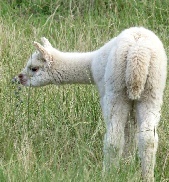 Jerome is sired by the well know Tijera Hugo, a male who prior to being imported to Australia was Grand Champion at the prestigious Arequipa Alpaca Fiesta in Peru in 2003! Hugo is known for having a dense, stylish & lustrous fleece as well as being superfine with his 7th fleece still only 20 micron. 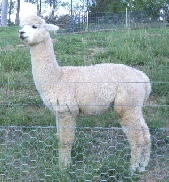 Jerome’s dam is sired by Cedar House Braveheart a son of the famous Purrumbete Inti. Jerome is a very gentle natured male who is a keen worker & carries a wealth of famous genetics & a background of stay fine, dense & stylish fleece.  Already producing ultrafine cria Jerome is worth considering for those wanting to add style & stay fine genetics to their herd. Jerome has done very well at large shows with a lot of competition. 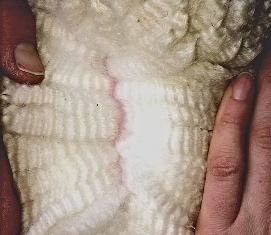 Jerome’s fleece even at nearly 9 years old is showing defined high frequency crimp & bundling that extends throughout his fleece, with very little guard hair. 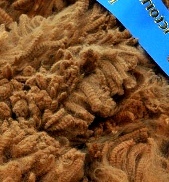 Patric’s 6th fleece was grid tested at the VER Spectacular show where he won 1st place in his class. 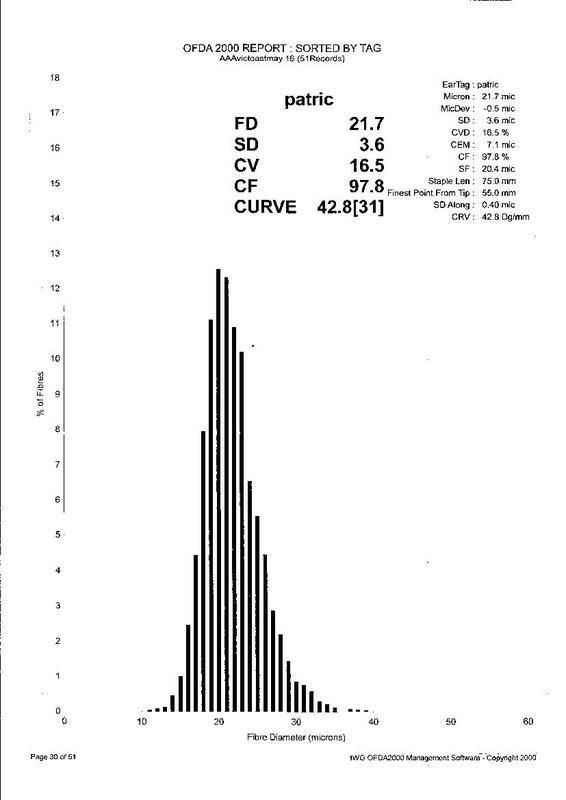 The results are almost identical to his single midside test above!!! 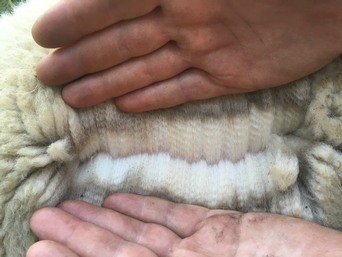 A male whose super dense fleece is standing the test of time, holding fine & displaying style and lustre at over 10 years of age that you would expect to see on males half his age. 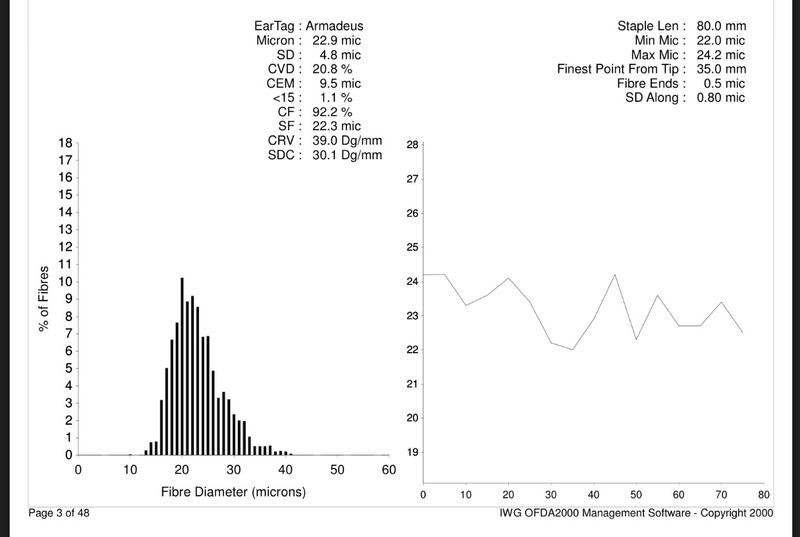 His 10th fleece histogram shows a very straight profile which is testament to his very even fleece. An outstanding male from the famed Windsong Valley herd. 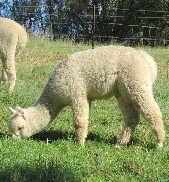 Amadeus is an elite male with a super dense fleece. 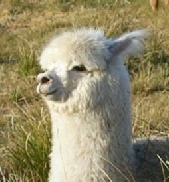 Even at 12 years old he looks like a much younger male, with a bundling, lustrous fleece with defined crimp. 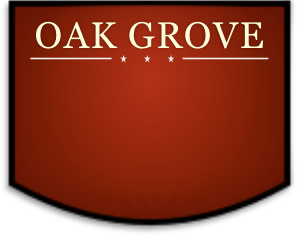 Amadeus is the newest male to the Oak Grove stud male line up. He is an impressive upstanding male who is true to type. 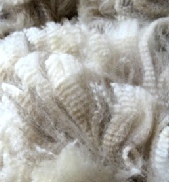 His fleece is incredibly dense with very little coarse primary fibre and he carries his lustrous fine fleece into the extremities. 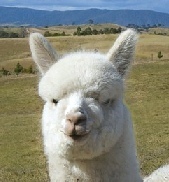 He has consistently been the sire of champion progeny in both fleece & animal classes. 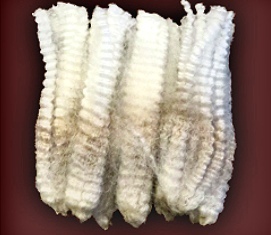 Many of them have ultrafine stay fine fleeces with excellent density, beautiful confirmation and fleece style. He has produced quality over and over regardless of the dams quality. Density, fineness, brightness and style, are all long lasting traits in Amadeus progeny which is why we acquired him when the opportunity arose. This male has a presence about him that says quality, come & see him for yourself & you will know what we mean. A son of WV Kenjiro (23.7 mic 7th fleece) who carries double Highlander genetics & grandson of the famous WV Iceman he comes with a pedigree known for it’s consistency for producing quality progeny. 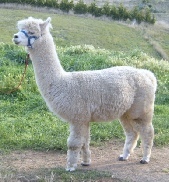 Kenjiro’s dam Tamika was still 21.6 micron at 12 years of age. 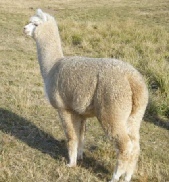 From his dams side he incorporates Cedar House Braveheart & Purrumbette Inti into his genetic lineup. Although not shown himself his progeny's show records speak volumes. 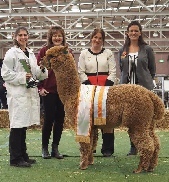 Including Supreme Champion fawn at the 2015 Victorian Colourbration & Best fawn fleece at both Canberra Royal & Sydney Royal in 2016 as well as many other championship ribbons. Many of his progeny & grand progeny are winners of championship ribbons or have been retained as ET donors.